Putting a legendary factory racer onto the public highway. Amid the bustle and hubbub of a popular Riviera restaurant, a baritone burble rises through the floor, vibrating up high, elegant heels and tapered table legs to resonate around the rims of thin-stemmed wine glasses. Angry pops and crackles from the street outside are followed by a final ear-splitting bark that sees food spill from silver forks and a waiter, weaving through the startled diners, drop an unopened bottle of Biondi Santi onto unforgiving terracotta tiles. Or at least, this is how we like to think it plays out whenever Claudio Roddaro pops out for dinner. 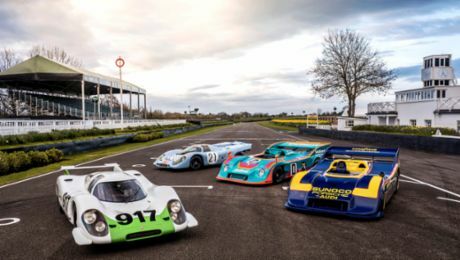 For this affable young amateur racer has realised the 24-carat fantasy harboured by most of us diehard Porsche fanatics, by not only owning a genuine 917, but by making it road-legal. Monaco resident Claudio bought 917-037 in 2016. An avid collector, and driver, of rare Porsche racers, he immediately set about getting it registered for road use. Now this is not an easy thing to achieve with a 40-something Le Mans sports prototype. But, crucially, there was a precedent. In fact, there were two. A pair of genuine 917s had previously been road-registered, one, chassis number 917-021, a long time ago, and only briefly. The other the famous no. 030 car, owned almost from new by the late Count Rossi, the Italian nobleman who masterminded Martini’s famous sponsorship tie-in with Porsche. Via a highly suspect loophole, this all-silver, leather-trimmed Behemoth has remained road-legal ever since it was retired from racing duties in the early 1970s. And it was this car that would come to Claudio’s rescue. In order to get his 917 KH approved for road use, Claudio had to prove that it was identical to the Rossi car. This was no easy feat, however. The unfinished 037 chassis was acquired by Germany coachbuilder Baur in the late 1970s and the car remained unbuilt for decades. It was eventually sold to a US collector who instigated its assembly in the hands of Carl Thompson at Gunnar Racing in Long Beach. In April 2004, more than thirty years after its life began, 917-037 made its rather overdue public debut at the Rennsport Reunion in Daytona. 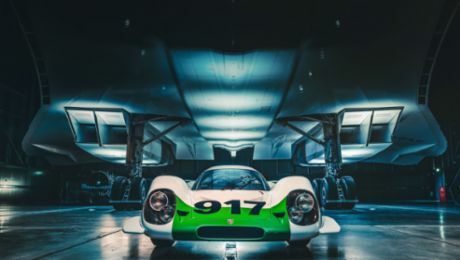 Throughout its life, however, Porsche had remained aware of the car’s whereabouts and was able to furnish the owners with a chassis plate upon request, authenticating 037 as a genuine 917. This would make it the final build, and because it was made up of around 95 percent original Porsche parts, also the most original 917 in existence – an assertion helped enormously by the fact that it was never raced in period, and therefore never crashed. Back in Monaco, after two months of painstaking bureaucratic procedure, mountains of paperwork sourced and sorted, endless hoops jumped through, the job was finally done. Claudio’s 917 KH, resplendent in authentic Martini racing livery and period sponsor decals, now also sported a very fetching pair of number plates. Its 4.9-litre air-cooled flat-twelve engine was, and still is, good for in the region of 600bhp, serious stuff even among today’s lofty supercar hierarchy. But this is a car that weighs just 600kg, well under half the weight of a current 911 GT3. And that, of course, means achieving the hallowed 1000bhp/tonne. On the road. In a car almost half a century old. Rumbling around the busy streets of Monte Carlo and hollering up the hillsides that fringe the French and Italian Rivieras, there are supercars and hypercars aplenty, the ubiquitous playthings of competitive playboys. But it’s nice to the think that, now, whenever the Claudio gets peckish, the competition is moot. First published in Speedster [France].